We can provide with the products for customer's needs. products are recommended as thermal insulation in stove,cave dwelling of steel mill,petrochemical,ceramics,glass,cement industries and power industries as well as other various ancillary heating equipment. products are recommended as thermal insulations of piping and equipment in power station,steel mill and petrochemical industries as well as other various fields. 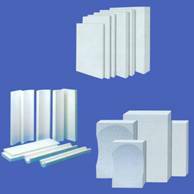 It can also be speciffied to use in furnace as backing material of refractory bricks. 1.Moisture resistance thermal insulation product is also used as waterproof material. 2.calcium silicate insulation and special-purpose auxiliaries for construction.